Study: Perfekt for to personer og fullt utstyrt for fire personer, 40 m2. (Med air condition, kjøleskap, TV. Kjøkkenkrok, lin, dobbeltseng og to enkle sofaer, bad, wifi). En leilighet: Perfekt for fire og utstyrt for 8 personer, 80mt2 (med air condition, kjøleskap, stekeovn TV kjøkkenkrok, lin, dobbeltseng og to soverom ett med dobbeltseng og det andre rommet, to fulle bad. tre sofaer og to enkeltsenger og en dobbel. wifi). Med utsikt over Castillo de Santa Barbara og Dome av Cathedral of St. Nicholas. Hotellet ligger i hjertet av gamlebyen 5 minutters gange til stranden og havnen, omgitt av de viktigste turiststeder, katedraler St. Nicholas Hall, Santa Maria kirke, basilikaer, Santa Barbara Castle, Museum, Museum of Contemporary Art (MACA) Archaeological Museum (MARC) og viktigste teatre, parker Ereta, butikker, supermarkeder, butikker (Central Market), også omgitt av nattelivet i barer, tapas, pub og 10 minutter på Casino. Unødvendig bil har transport og direkte flybuss, taxi og trikk bundet for bestått Campello Denia, Benidorm og Altea. Marina hvor du kan leie båt og nyte Volvo området. Reaching Tabarca. Feirer påske (i Santa Faz), Los Reyes Magos (første uken av januar) The Feast of San Juan (slutten av juni). attraksjoner .Considerados turist. Sikret Medieval markedet, frukt og raker. Utflukt til Castillo de Santa Barbara ved Ereta park. Og nyte vår gode klima. Romslig med alle fasiliteter, bad inkluderer håndklær, tepper, såpe, sjampo og papir. Maritza est une femme très accueillante, sympathique et de toute confiance. Appartement conforme à la description. Nous le recommandons. Christian S.
A peaceful location in spite of being right in the centre of the old town, convenient for the Mercado tram station and for the bus to the airport, as well as walking, shopping, beach, eating etc. It is located on the third floor with an efficient lift. The rear windows overlook a bit of a building site, quite usual for such a setting in Alicante, which is currently undergoing quite a lot of renovation, but we suffered no significant disturbance from noise. The front windows are large and it was lovely to open these and enjoy the morning sunlight and a view of the castle and the old town. The apartment is really well equipped and the welcoming owners made every effort to ensure we had a comfortable stay, both at the start and throughout our stay. We were there for over a month through January and into February and, given that we also experienced the coldest spell in Spain for many years, it was pleasing to find that the heating system was sufficiently robust to keep us warm throughout. We really enjoyed our stay in Alicante, having such a nice homely apartment made all the difference. There is nothing to dislike, but be aware that the area does get very lively to 4am on Friday and Saturday nights (only) even in January. But as one other reviewer commented, because the bedrooms are at the rear of the apartment they are pretty well insulated from the street noise. Tolles Apartment mit 2 Schlafzimmer, 2 Bäder und Wohnzimmer in der Altstadt von Alicante. Blick auf die Burg Santa Barbara. Stadt, Hafen, Promenade, Restaurantso, Bars und Strand sind fußläufig erreichbar. Aufgrund einiger Bars in unmittelbarer Nachbarschaft ist es am Wochenende etwas laut. Trotz nächtlicher Anreise hat alles super geklappt mit der Vermieterin. Lovely apartment that is well equipped. It is very clean and has everything you need for a short stay. It is centrally located and everything is just a short stroll away. Thank you Maritza Always on hand to answer questions before hand and a lovely friendly welcome. 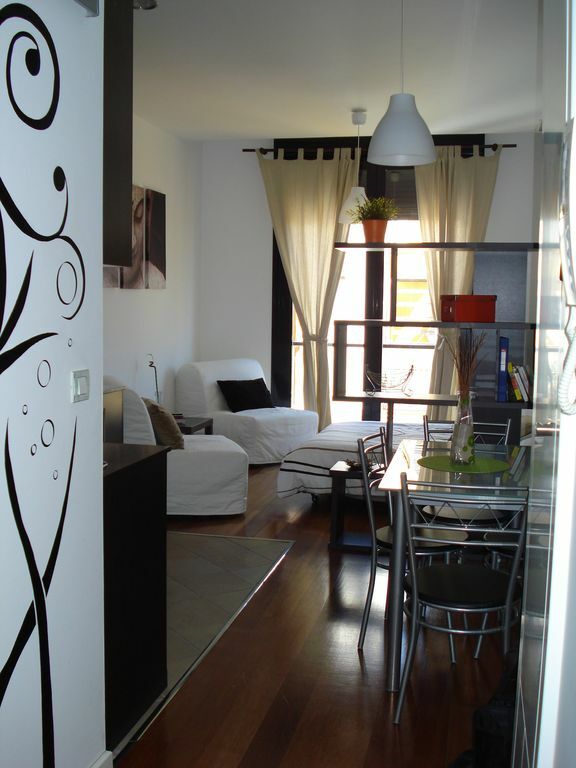 Perfectly positioned to experience Alicante this nautical themed cosy studio everything you require. there is an abundance of restaurants and such a lovely place. Beach is close (we opted for the hotel spa just around the corner) and did the boat trip. Should Alicante be on our destination list again we'll be back to stay.I recommend, and I'm sure return next year. Regards Clelia. Excellent séjour passé à ALICANTE proche de toutes les commodités. En plein centre du centre d'ALICANTE, à 100 m de la plage. Idéal pour un séjour en famille. Maritza est une femme très agréable et très serviable. Nous la remercions pour son accueil et son amabilité. L'appartement est magnifique, moderne, avec tout ce qui est nécessaire pour passer un séjour de rêve. Encore un grand merci à MARITZA pour ce bel appartement et son accueil. Christian LOZANO. Kokett Apartamentode nybygg i sentrum; 80 MT2. Fasiliteter som tilbys er gode boliger, for å gjøre ditt opphold komfortabelt, perfekt for 4 personer og har plass til åtte. Fullt utstyrt, (heis, air condition, kjøleskap, TV, kjøkken, lin, dobbeltseng og to enkeltsenger i salongen 3 sovesofaer, bad, wifi. Med utsikt over Castillo de Santa Barbara og Dome av Cathedral of St. Nicholas. Sin utmerkede beliggenhet i gamlebyen (El Barrio), og nær stranden Postiguet gjør det et godt valg for din ferie, underholdning og engasjerende aktiviteter for de reisende, både for en getaway venner og familie. En 10-minutters spasertur fra stranden og havnen, omgitt av turistattraksjoner, katedraler rådhus, kirker, basilikaer, slott, museer, teatre, parker, butikker, supermarkeder, butikker (Central Market), barer, tapas og pub. Du trenger ikke å ta bilen, har transport og direkte flybusser, drosjer og trikk på vei til Denia bestått av Campello, Benidorm og Altea. Marina hvor du kan leie båt og nyte Volvo området. Den store Casino. Feirer påsken (Holy Face), festivalen av San Juan i slutten av juni. Middelalderske markeder. Ankomsten av Kings. Ansett av interesse. 3. el importe fijado en la tabla supone el precio final, incluido el servicio de sábanas, toallas, gasto de luz y electricidad. 4.Dependiendo la duracion de la estancia se ofrece servicio de limpieza por 20€ (opcional).